Best way to tune your ukulele quickly! Well, you can tune your ukulele by ear, but that’s a skill to learn in itself, and not one I’d recommend if you’re new to learning to play an instrument. You’ll want to be able to tune your ukulele quickly so that you can keep playing in tune. I’d recommend using an electronic clip on tuner. I use a Kala Ukulele tuner and so do the kids in my ukulele groups. It’s inexpensive costing about $29 NZ, and can tune just about any other stringed instrument too. It works by clipping onto the end of your ukulele and detects the notes your ukulele strings are tuned to by detecting vibrations. The other great advantage of a clip on tuner is that if you’re playing in a group you can tune correctly without the noise of other ukuleles interfering with your ukulele while it’s being tuned. Once kids can use a clip on tuner, most can tune their ukulele within 30 seconds. 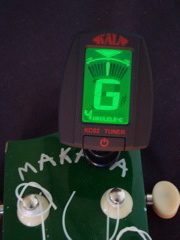 There are other similar clip on tuners that do the same job. If you don’t have an electronic clip on tuner go and buy one. You’ll be glad you did.